Meanwhile, we are ready with another video that deals with customer account at our store. In this video, you will learn how to create an account and what benefits it gives you. Enjoy the show! To get you acquainted with our store and to help using it, we have created this instructional video on order placement process. More instructional videos are coming soon, stay tuned! Toner Cartridge Depot are pleased to announce that international shipping capability has been added to the range of products that was previously only available to domestic customers. The printing supplies international shipping service is one that benefits all customers in a world wide market. Toner cartridges shipping to customers other than in the U. S. Market, is a welcome addition to services. The ability to accept orders from other countries means that the marketplace is expanded for the firm. In addition, it makes products available to customers any where in the world. When the supplies to operate the printing equipment are available, customers are more likely to purchase the printers. With a large inventory of toner cartridges available online, finding the exact model that is needed is simplified. The order and purchase process online is simple and secure. Domestic shipping and international shipping are now equally available to complete the satisfactory customer experience. Most of the major brands are carried in stock so that deliveries are prompt and secure. In addition to Xerox, Epson, Lexmark and Dell, customers can purchase Compaq, HP and Canon supplies for printer equipment. Learn more about the expansion of shipping services to international customers and how Toner Cartridge Depot is providing quality products globally by clicking on the links at www.tonercartridgedepot.com today. Individuals and press members who have further queries concerning toner cartridges shipping should contact at the location provided below. Before delving into the details of the way declared in the title, we want to tell you a short story. Once upon a time there was a man who got in charge of a large fleet of printing devices. And he would be happy ever after, unless one day his printers started to run out of toner. At first, the man was able to find cartridges for empty printers as they were easily accessible on the market. However, with more printers coming out of order, it was getting harder and harder to buy necessary replacement cartridge in one place. Further on, he had to run around all vendors looking for a specific item. As time went by, the man spent more and more time seeking toner since the printers did not get upgraded and old cartridges became harder to find. Not to mention he could not remember vendor he previously purchased from. Finally, the man could not take it anymore and, tearing his hair out, he escaped to a desolate island to be lost for all humanity. It’s a fairytale, but it could have been a reality. If you have one printer, you’re just a happy owner. Same is true for 2 or 3 printers. But once you have dozens on printers to take care of, things get out of control easily. TonerCartridgeDepot.com offers a way that would’ve helped our imaginary man keep his sanity and cope with all the hardships of repeated cartridge replacement. We believe it would also help you. The idea is simple. You place a fancy logo on your site in exchange for a personal discount on whole range of our cartridges inventory. The logo is also a reminder of where you previously bought cartridges — you’ll never forget your site’s domain name, right? There still are and will always be many old machines in use that require replacement cartridges, despite dozens of new printers coming out every now and then. A good printer supplies shop would offer you cartridges for both old and new printers. Managers of medium and large offices or printing shops are likely to buy cartridges in bulk, this is natural. It also comes natural to expect a volume discount from your printer supplies provider, if you buy lots of cartridges. However, you don’t have to own a whole office of printing devices to buy large to buy cheaper. Remanufactured cartridges are a time-proven way to cut you printing costs. Buying several remanufactured cartridges is a way to cut the printing costs even more. Make sure your supplies provider offers you this option. and every order. That’s how we believe a true delivery from a good printing supplies seller should be like. The free gift should always be there. Period. Office Profile and for registered users are standard options for a modern online store. You wouldn’t buy from somebody in real life, so why would you want to do that online? Choose a trustworthy and reliable supplier of cartridges for your printer, with a good reputation and a solid history of online business. Products seem to be delivered to the consumer in ever more packaging these days. And the consumer is forced to pay for it in the end — not just environmentally but financially as well. Tax dollars go to pay to reuse or recycle excess packaging — or to truck it to a landfill site. In Germany, for example, you can see a distinct difference in the way products are packaged. The same products you can buy in the United States are available there with less packaging, less-toxic or non-toxic components and more recyclability because manufacturers must comply with federal laws that require them to design their products for the environment, not the dump. Historically, the United States hasn’t been big on that kind of federal legislation. This is the land where the consumer is king or queen, so it’s up to us to make this kind of change happen. One-third of American garbage is packaging materials, according to the Environmental Protection Agency in Washington. And there’s not necessarily a good reason for it. Many companies are simply following convention and haven’t looked into better ways to package their products. Not only is minimal packaging better for the environment, it also costs less to produce. Companies can save a lot of money when they reduce packaging. The small grey object you can see in the middle of the picture is an ink cartridge, most of the rest of the stuff you see is waste. 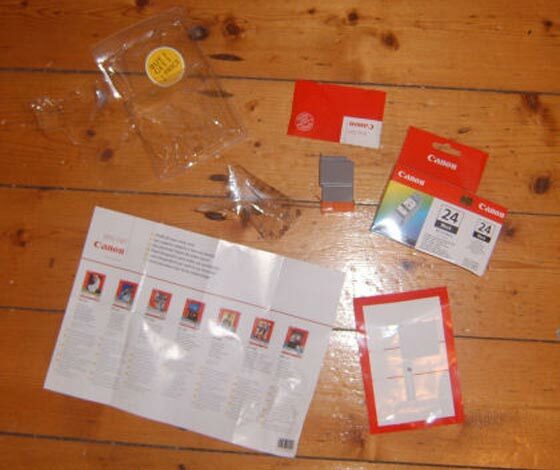 The cartridge comes in a small sealed plastic pouch, which is in a box with various papers. This is then packaged in an entirely unnecessary plastic container which is virtually impossible to open. Another thing is that when you buy ink and toner cartridges online, seller often add styrofoam packing peanuts or other filler to prevent possible damage of cartridge in parcel. Taking into account that a toner cartridge box usually already contains protective filler (for instance, HP toner cartridge is surrounded by an air-filled safety “jacket” in box), it even increases overpackaging and, eventually, lanfill. More important is that these styrofoam packing peanuts cost you additional money. Avoid snacks and other foods wrapped in individual serving sizes. Instead, buy bigger bags of the snacks and put smaller servings in paper bags. Buy personal hygiene and home-cleaning products in bulk when possible. Buy cereal in bags instead of boxes, which usually contain bags inside. Buy loose fruits and vegetables instead of those packaged in Styrofoam trays and shrink-wrap. Fix your own fresh-fruit cups instead of buying cut-up fruit in plastic containers. Avoid buying products packaged in blister packs (molded plastic attached to cardboard.) Although sometimes blister packs serve a hygienic purpose (making sure cosmetics or medicines aren’t tampered with, for instance), they are often unnecessary. Use fewer individual serving-size bottles of water and juices. Buy ink and toner cartridge at Toner Cartridge Depot. For several years TCD has been having the main page intact. But time go on, so does life, and what was current once, is obsolete now. “The time has come” — that is what we decided and released a new version of the home page. Here we must warn you, unlike on the picture above, in real life tabs don’t switch automatically. You will have to click the tabs yourself! The list of brands has changed its look. Now you can see the size of font is smaller for less popular brands and is larger for more popular brands. The Supply Finder has moved to a personal tab and its larger font won’t let you click a wrong menu item by mistake. The Bestsellers now have their own tab, too. How could that be helpful to me, you may ask? The Bestsellers are cartridges that sell best for they are popular, that is compatible with popular printers, and the chances are you printer is one of those. Tag line is: find your toner cartridge faster! A tab with Hot Deals. A bit of advertisement never hurts, you know. Besides, this section of the store offers cartridges at prices that are really hard to resist. Bottom line is… well, actually it’s a bottom row — the most current information on discounts and gifts available in the store. The idea behind the makeover of the main page was to give it a modern look and. More importantly, make it more convenient for you, our customers. You are welcome to share you opinion on the new home page.